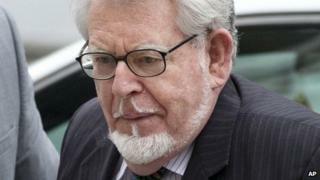 Rolf Harris is facing three further prosecutions for sexual assault including one against a girl "aged seven or eight", prosecutors have said. The three counts are in addition to 13 alleged sexual offences which the entertainer was charged with in August. The new counts are against females aged 19 in 1984, aged seven or eight in 1968 or 1969, and aged 14 in 1975. The Crown Prosecution Service (CPS) said the allegations related to one existing complainant and two new ones. The count relating to the 19-year-old involves the same alleged victim as six of the earlier counts. A CPS spokesman said: "These three allegations were included in the file sent to the CPS by the Metropolitan Police in August of this year; however, as part of the ongoing review process for all cases, it has been decided that these allegations should be formally added to the indictment as further counts. "Evidence relating to these further counts has already been served on the court and the defence, so it is not necessary for Mr. Harris to appear again at magistrates' court." Mr Harris, 83, of Bray, Berkshire, will next appear at Southwark Crown Court for a plea and case management hearing on 14 January. He appeared at Westminster Magistrates' Court in September where he was bailed and his case referred to Southwark Crown Court. A preliminary hearing at the Old Bailey in October set his trial to start on 30 April.